Students for a Free Tibet (SFT) India works in solidarity with the Tibetan people in their struggle for freedom and independence. 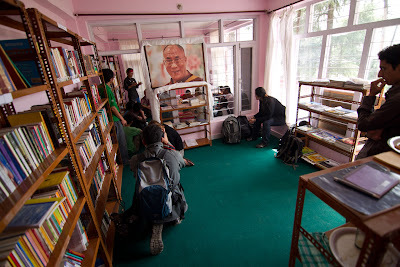 On a recent visit to Mcleod Ganj in Dharamshala, I chanced upon the Dharamshala Community Library. Tucked away in a quiet corner just off one of the main roads, its a perfect place for a library to be located – the view of the mountains on one side and a mountain of books on the other. The Dharamshala Community Library was started in October 2008 and was initially funded by the well known Indian writer Pankaj Mishra. The library operated for a year before it had to be shut down because of the lack of funds. 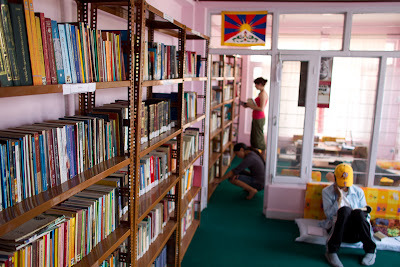 The library was finally reopened again in April this year and its board members constitute of Tenzin Tsundue (writer/activist), Bhuchung D Sonam (poet/writer), Ashwini Bhatia (Journalist) and Tenzin Choeying (National Director of Students for a Free Tibet India). The main purpose of the library was to inculcate the habit of reading among the residents of Dharamshala, especially for those living in the town of Mcleod Ganj. The town does not have a singe library despite having a population of a few thousands (local Indians and Tibetans). In Dharamshala, there is a huge presence of books everywhere.. in cafes, in bookshops, etc. But these books and stores cater mainly to the tourists who visit the town. Ironically, the reading culture is less prevalent amongst the local populace. “Both, young Tibetans and Indians need a space for reading and to expand their intellects. Currently, there is a poor reading habit among Tibetans and we felt a space for reading books would definitely help. We also wanted this space to be used as a social, educational and interactive platform by organizing discussions, movie screeenings, inviting guest speakers and thus contributing to the intellectual growth of the young people “, says Choeying. When asked about the kind of books the library houses, Choeying mentions that the library will cater to the need of both English and Tibetan readership. The readership is also divided because many young Tibetan s read and write in English while there are also many young Tibetans who read and write in Tibetan. Generally, among the community living in exile, the work of Tibetan authors and poets is not well known and this library sets out to make their work more popular. How will the library engage the local populace and make it a more interactive space? Choeying’s answer was that even before they started the library, the idea of an interactive space had been felt and this space could be used to organize discussions relating to the issue of Tibet, screening documentaries, hosting debates and more. The library has a collection of around 20,000 books but because of the lack of space, many of them are currently not on display. ‘We are still looking for a bigger space in town. Right now it is a 2 room set library. But as the saying goes… everything starts from scratch’, says Choeying optimistically. The response to the library has been very positive so far. The library was inaugurated by the welfare officer of Mcleod Ganj and around a thousand books were donated from welfare office library which was closed down five years ago. When I walked into the library, I was curious about the children’s books the library stocks. I found a few books by Indian publishers on the shelves dedicated to children’s books. Certainly not enough books for the kiddies! A few copies of our book ‘Chuskit Goes to School‘ were donated to build the children’s book collection and I was pleasantly surprised to see a huge stack of books published by Lama Mani books (Read about these books on Tibetan life in exile here) when I visited the library the next day. “We are still in the process of collecting books from friends, supporters and tourists to cater to the need of children. We have collected a number of comic books but there is not enough material for children in Tibetan and books about Tibetan life and culture”, says Choeying. But what is a library without a good librarian? Pema Tso is the librarian of this beautiful library in the hills and you know that she loves books when you spot a number of books and a dictionary on her table. When asked which her favourite book is, she picks out a copy of the children’s book Heidi and grins. Pema has learnt English only recently, but she loves the book so much that she is trying to translate it into Tibetan so that more people can share the joy of reading this delightful book. When you see her notebook with her notes, you know that this library is in good hands. Please sign this petition to strongly urge Shri S. M. Krishna, The Minister of External Affairs to make a strong and clear statement acknowledging the crackdown in Tibet, and to highlight the human rights violations being carried out in Tibet today. We will deliver this petition on October 2nd, 2012 - Gandhi Jayanti - a day that symbolizes our nation’s ability to reject colonial rule, to recognize freedom as our birthright, and to regain our independence. National wide Candle Light Vigil wil be organised by our Indian Members and supporters in all the Indian major cities that day. Tibet Needs You Now! Students for a Free Tibet, India (SFT India) is the India National Network of Students for a Free Tibet International, which has over 650 chapters in more than 35 countries. We are a Non-Profit Organization funded entirely by our members and supporters. Founded in the year 2000 from a very humble beginning as a loose network of few young activists and students based in Dharamshala campaigning for Tibet’s Independence, SFT India has grown as nation-wide network of youth, campaigning for the Fundamental Rights of the Tibetan people, and we are still growing. It is from our grassroots network that we gain our strength. To ensure the effectiveness of our grassroots network, we create awareness and sensitize the world on the just cause of Tibet. We believe that young people can and must take responsibility to change our world for the better. Please sign this petition to strongly urge Shri S. M. Krishna, The Minister of External Affairs to make a strong and clear statement acknowledging the crackdown in Tibet, and to highlight the human rights violations being carried out in Tibet today. We will deliver this petition on October 2nd, 2012 - Gandhi Jayanti - a day that symbolizes our nation’s ability to reject colonial rule, to recognize freedom as our birthright, and to regain our independence. National wide Candle Light Vigil wil be organised by our Indian Members and supporters in all the Indian major cities that day. Tibet Needs You Now!